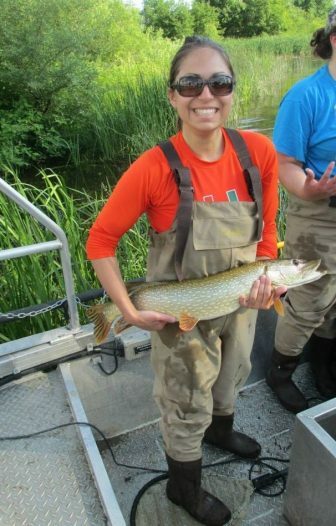 Katie O’Reilly spends the summers “mucking” through the marshes and wetlands of Lake Michigan collecting yellow perch (Perca flavescens), and performing fish autopsies to learn about where they’ve been and what’s been on their metaphorical meal plates. Yellow perch are wanderers, she said. Their ear bones share secrets about their lifespan, while trace elements within the bones can detect where they’ve been. 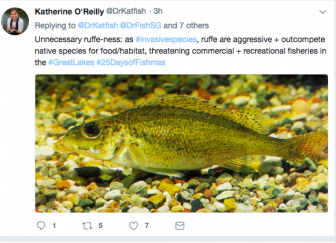 O’Reilly created a new holiday celebrated on Twitter with the hashtag “#25DaysofFishmas.” It’s a hat’s off to Great Lakes fish — a group of animals that O’Reilly said are often out of sight and out of mind. O’Reilly’s featured fish arrive daily on an Advent-style calendar as countdown to the 25th. They are donned with festive holiday hats. 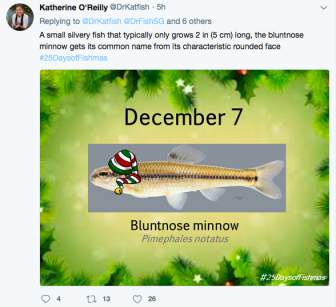 The bluntnose minnow arrived with a green, red and white striped hat comically placed over its serious fish face on December 7. People also tweet stories about their childhood memories of Great Lakes fish, she said. “One day we featured the northern pike, and a lot of people shared pictures like ‘oh, this is when my dad took me fishing, the northern pike we caught,’” O’Reilly said. She said alewives (Alosa pseudoharengus) also spawned a lot of comments, with some people recollecting massive die-offs that lined the shores of Lake Michigan in the mid-1960’s. O’Reilly’s followers increased from 1000 to 1500 last year. She’s added more online chums for Fishmas 2017 as a result of the interest. Many seem to be having fun with her fish facts. 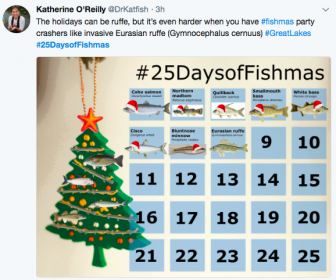 While the holiday season may usher in snow, #25DaysofFishmas will feature a mix of science and good humor, O’Reilly said. O’Reilly started Fishmas last year. She was encouraged by followers to continue. Fish fanatics from other regions also launched Fishmas celebrations on species outside of the Great Lakes. O’Reilly said she’ll probably continue the tradition next year.